Why would there be a gearbox in the turboprop but not on the turbofan? Was this just a result of a simple, quick, representative sketch? Or did authors forget to add the gearbox to the turbofan? The gearbox is necessary so that both propeller and core engine can operate at optimum rotational speed. There it says "optimum rotational speed". Is that the speed of the compressor? The speed of the fan? Or maybe an intermediate, flight-airspeed-dependant speed? How does the gearbox know which is that "optimum speed"? The bigger the diameter, the lower the optimum speed. Generally, fan and propeller blades should run at a high dynamic pressure, but still at subsonic speeds to avoid the higher losses involved with supersonic flow. Since the tip will be the part with the highest speed, and propellers have bigger diameters than fans, propellers run at lower speeds. 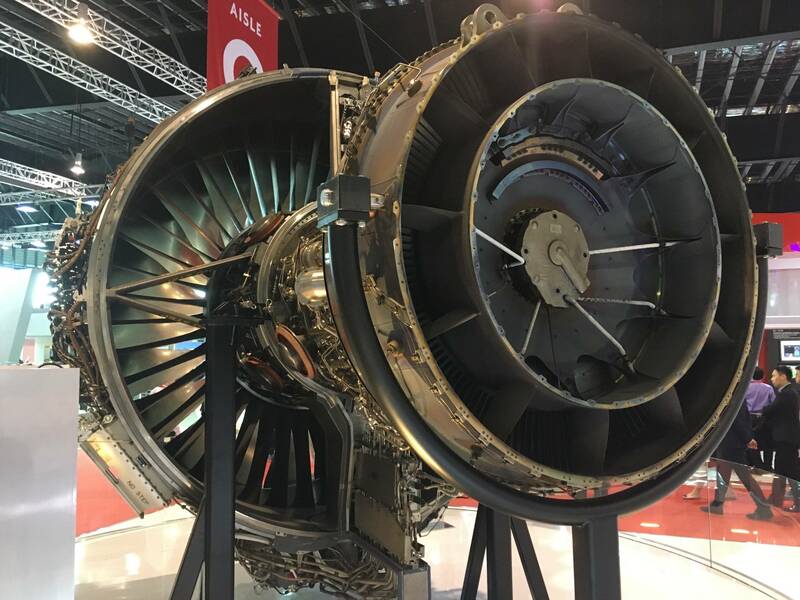 The high pressure compressor and turbines of an airliner engine will run at above ten thousand RPM, while the propeller wants to run at about 1800 to 2200 RPM. The propellers on the Tu-95 even run at only 750 RPM. Both the fan and the propeller are powered by separate low pressure turbines which also have an optimum speed, and the faster the turbine runs, the more torque it will produce for a given size. For that reason, the low pressure turbine and the shaft of a big airliner engine run at between 2500 and 4000 RPM, and the turbine of the PT-6, a classical turboprop engine, at 30.000 RPM. Since power is torque times RPM, a faster running shaft will be lighter than one running at low speed, so the speed is only reduced directly at the propeller mount. A fan's optimum speed is between that of the compressor and the propeller and would ideally also need a gearbox, but here the transmitted power is so high that a compact gearbox will be hard to design. Even if it runs at 98% efficiency, it will produce waste heat in the order of several hundred kilowatts in case of a big airliner engine. Some small engines with just a single turbine use gearboxes already (e.g. the Lycoming ALF507), and now the next generation of efficient fan engines are also introducing gearboxes. But so far, most engine designs have preferred to run the fan faster than what would be ideal. Note that the tip speed of a modern, ungeared fan is already well above Mach 1. Their bigger diameter makes propellers more efficient. The more air mass is involved in thrust creation, the higher the propulsive efficiency will be. Fans need to be smaller precisely because they will run with the speed of the low pressure turbine, and to convert the available power into thrust, they need a much higher solidity ratio, which translates into a higher wetted surface, which increases friction losses. There it says "optimum rotational speed". Is that the speed of the compressor? The speed of the fan? Both. Each has its own optimal speed (that is not the same) and the gear allows them to work at that speed. Defining what "optimal" is, is part of the engineers job; usually "optimal" is what gives the maximum efficiency, but depending on the design restrictions a different speed might be selected. How does the gearbox know which is that "optimum speed"? It does not "know", it is simply built so that everything will run smoothly. In this question it has been explained why there is not manual transmission on aircrafts: the gear ratio is fixed. This also answer your question, it is fixed and the gear ratio is selected during the design phase. Why would there be a gearbox in the turboprop but not on the turbofan? Because the propeller runs at much slower speeds. The fan can be connected directly to the low pressure turbine, while a propeller would rotate too fast. The propeller rotates much slower than the fan because it operates on a different principle: the fan accelerates a smaller amount of air by a larger $\Delta V$ (it has to act also as a firts stage for the compressor) while the propeller accelerates an higher amount of air by a smaller $\Delta V$. This difference is noticeable also in other three aspects: the fan is ducted and has many more blades (remember, it's a first stage for the compressor), while the propeller has a few blades and is not ducted; additionally, as Peter mentions in his answer, the propeller generally has a larger diameter than a fan. The scale of the gearbox. A B777 delivers over 100,000 hp of power (torque at the fan times rotational speed). The largest geared turbofan presently in production and installed on aircraft in regular service, the PW1000G, produces 30,000 hp. The environment that the gearbox is exposed to. Manoeuvres, gusts, landing bumps, air turbulence create big problems for keeping the geared fan rotating within tight tolerances with the nacelle. Rolls Royce is currently developing and testing the Ultrafan and has successfully tested at 70,000 hp. The current Trent 1000 has the LP turbine running at the same RPM as the fan, and this results in the LP turbine running relatively slowly. The problem is partially solved by expanding the radius of the LP turbine, so that the linear turbine blade velocities are higher. Expanding the LP turbine further is not an option, due to the higher drag and weight penalties that would involve. A gearbox would speed up the LP turbine and would allow for a smaller LP diameter, with associated lower weight. 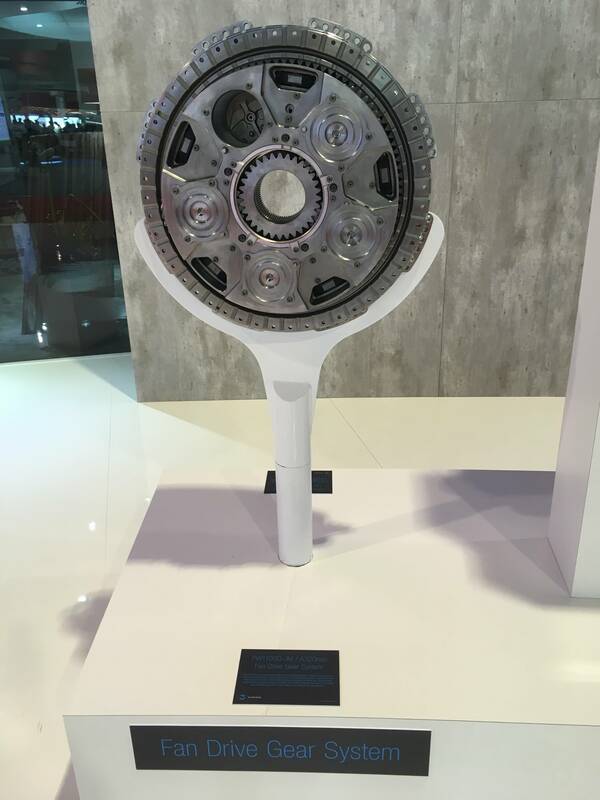 Source: a discussion with a Rolls Royce engineer at the Singapore Airshow. Turboprop engines are (generally) powered by centrifugal or axial/centrifugal flow engines. These are smaller (again, generally) than an axial flow engine. This small size allows components to rotate at really, really, really ridiculous speeds, up to 50,000 rpm (maybe more). Spinning a propeller at even 5000 rpm is very inefficient for the few seconds the blades would stay together. The gearbox reduces the rpm to speeds slow enough to design a propeller around. A propeller has a bigger diameter than a fan, and because of that, the structure of the blade on a propeller sustain more 'g' (more centrifuge force if you will) so the blade of a propeller will eventually explode if it rotates to fast, because there is more mass away from the center of rotation, it 'pulls' everything outside. It's rotational inertia. (and you need a big propeller diameter because it needs to provide enough push for the airplane to fly). Efficiency dictates the optimun rotational speed of propellers and turbines so a gearbox will keep both of them at their best. As others have said the optimum speeds of the (smaller) turbine and the prop of a turboprop are wholly incompatible, with the turbine needing to move several times faster, whereas in turbofans while they are not optimum they are typically close enough to their optimum speed that the increased weight, cost, complexity and potential for failure of a gearbox to transmit the huge amount of power that goes to the fan is not worthwhile, so a direct shaft is used. Some smaller turbofans are geared which allows a faster, more efficient turbine and a slower, quieter fan but it is only recently that a geared turbofan big enough for an A320 has been produced, so I expect they're a while off yet for widebodies. Not the answer you're looking for? Browse other questions tagged turboprop geared-turbofan or ask your own question. Why do airplanes not have manual transmission? What is the difference between a turbofan and a turboprop engine? Why do turbofan blade tips exceed the speed of sound while prop tips should not? Is it possible to fly using a small engine? Why do turbofan engines have low pressure compressors? What are the limitations in adoptions of GTF (Geared Turbofan) technology? What are the differences between a helicopter engine (turboshaft) and an aircraft engine (turboprop)? What is the fastest single-engine civil turboprop aircraft with cabin seating? Is it possible to drive a prop directly from a jet engine without a gearbox? Has the Beechcraft company considered building a single-engine turboprop? Why is the bypass ratio of a turboprop higher than turbofan? Which engine type requires the shortest take-off run: a turboprop or a turbofan? For how long can a single-engine turboprop safely run the engine at idle? Why are turboprop intakes placed below the propeller?